Hello everyone. 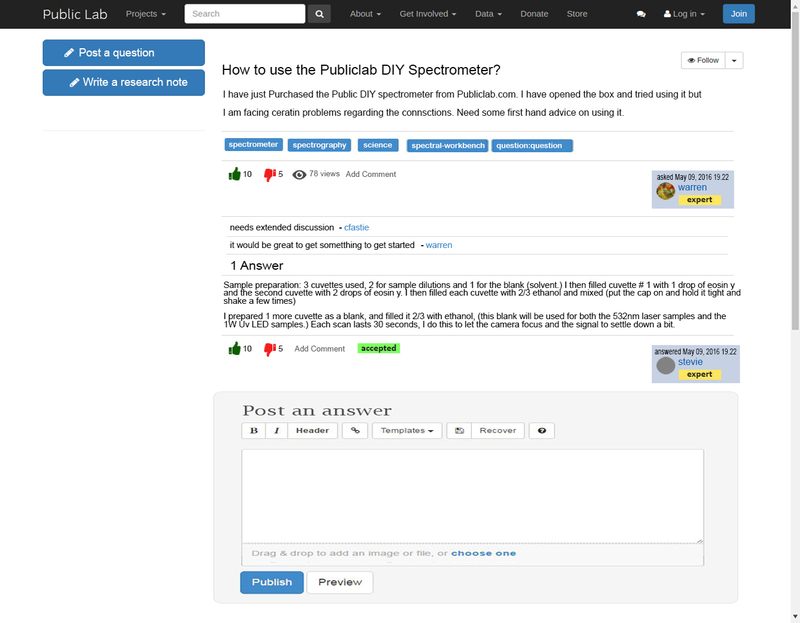 Here are the very early designs of the Expanded Q & A project for Publiclab.org. As you can see in the above image I intend to make a 3 column display for the the Questions page. Each box will contain the title of the question which will be linked to the show page of the question. It contains a list of tags related to the question. The number of tags displayed will be limited to a number of four or five.Along with the that it contains the likes/dislikes and the number of answers and number of views of the question. The time of the post is mentioned as number of days ago. This is similar to the format of Research Notes. The same type of Pagination will be kept. The Questions will be categorized as Recent and Most Popular similar to that used in research notes. There will be an additional category for ordering them as Most Viewed Questions. The Questions Show page will display the description of the question along with the title.The section just below the question description will contain the Like/Dislike buttons that will be be using the act_as_votable gem. We can add Comments by clicking the Add comment button which will open the comment editor just below the comments section.Here is a how it will look. The date and time of the post along with the user will be mentioned in the right hand box. The user reputation can be given here by giving badges according to user activity(like expert, begineer etc.). This is similar to the stackoverflow model. The Answers will be listed below the question section. The number of answers will be mentioned at the beginning of Answers section. The user who posted the question can select an answer as accepted and a accepted label will be shown below the answer. We can keep a check box for that. The answer editor will be at the end of all answers. It will similar to that of the Comments editor used in Comments. 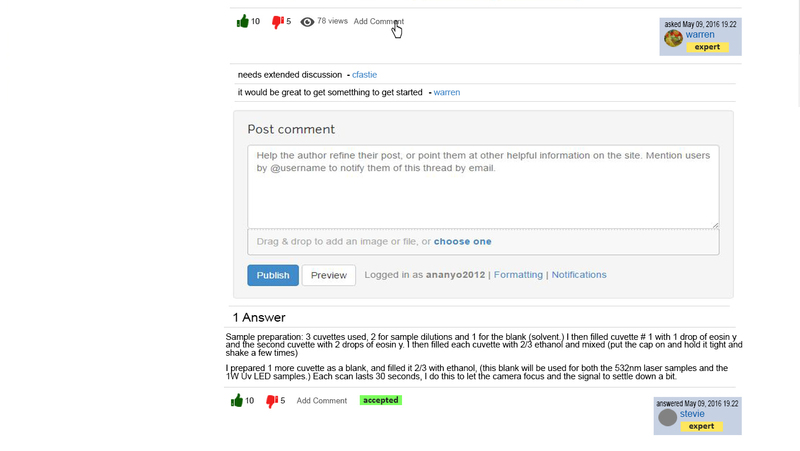 Comments can also be added to each answer using the Add Comment button along with the Like/Dislike button. The User and the Node model will be related to the Answers Model using has_many relations. A Node can have multiple Answers. Also an user can have many answers associated with it. Answer will have many comments and will be related to Comment s using has_many relations. For that a new field aid will be added to the Comments model. This is just the initial ideas for the Q & A Project. I will be coming up with more concrete ideas and updating this research note for more clearer view. Feedback from everyone in the community is requested to make improvements to the Project. What other things are missing? What changes are needed? Can there be a general way in which people "follow" questions. Some people really like answering them, or answering them on a certain topic. I see this is being different from following a tag, because that would include research notes and other material. Maybe we could include a place on the landing page for people to get alerts when someone asks a question, or a question on a certain topic. Similarly, can you sort questions by tags? Again, I see this as different from sorting everything by a tag, (you'd end up with notes and research notes as well) I guess this is as a separate search like we sort out questions first then tags that follow. I'm wondering why the person who answers the question gets to "approve" the answer? I'm concerned that it makes them the gatekeeper in a sense. Perhaps they got one they didn't think was particularly helpful, it still could be helpful to someone else. Also, they could end up moving on and not approving answers. The question could be left hanging looking unanswered with people contributing time and energy to respond without seeing their work show up. I think I'm more in favor of all answers showing up, and we could moderate first time posters like we do on research notes through the moderation group. Can you clarify the comment section? Is this for people to ask clarifying questions? I could see people accidentally answering the question there. I'm not sure I like the idea of having a dislike option. Just culturally for Public Lab, I'd rather be supportive of someone trying to respond than dislike an answer. I could see a function like this being used in moderation (as in making sure tone is ok) but I feel this should be dealt with in a different way. Is there a way for people to thread off of answers? As in, potentially ask for clarification or comment on why they disagree? for the reputation/ activity thing you mentioned, I think I'd rather just see a link to someone's profile than tag them with anything else, such as "expert"
Just chipping in on this, subscribing to the tag "question:balloon-mapping" subscribes you to all questions posted on the topic "balloon-mapping". So the "answer questions" button shown at https://publiclab.org/tag/balloon-mapping will allow people to follow as Stevie describes. Yes, you can go to https://publiclab.org/tag/question:balloon-mapping and see all the questions about balloon mapping. Some better place to list questions by different topics, or show common questions by topic, would be interesting. Great questions and comments -- i echo Stevie's enthusiasm! @stevie What I wanted to show is on clicking the Add Comment button the comment editor will show up below all comments of that section. For answers we can use an interactive editor similar to that used for posting notes as I have shown in the updated mockup. That way we can improve the user experience as well as distinguish it from the comments editor. @warren Instead of topic wise sorted question we can use the idea of Favourite tags similar to that used in stackoverflow. The user can enter a list of favourite tags and the questions will be sorted accordingly. Also we can save this choice and the users can be subscribed to the questions of those tags that way. @stevie Ok then we can drop the dislike button and keep a Upvote button similar to this one. Regarding the user approving an answer I think the person who posted the question should be the one who approves and it should not affect the overall response to that question because approval just adds a approval label to that question.Other answers are still present and the upvotes reflect its popularity. So an answer that seems more apt to others will have more no. of upvotes. While the user who posted the question can approve the answer that he was looking for that will add a approval label.Also it helps in the badging system.Please correct me if I am wrong. @stevie With respect to the user reputation/badging system we can use points according to the number of questions/answers and the number of upvotes on them. That would aid to the Rich Profile of the user. Instead of a something like an "expert" or "begineer" we can just use the number of reputations that would reflect the activity of the user in the community. Know we might not get feedback from @liz for a while because she is traveling, but I'm interested to hear her thoughts on the badging system. In some ways it seems similar to something we've spoken of where someone's profile changes based on their amount of activity on PL which seems similar, but I'm weary of the authority it might give someone visibly on the site. What about for the upvote HTML, reusing the already familiar Like template, and modifying it so it can be used for upvoting too -- Ajaxy, too. Or if that's too much complexity to make it do both, just copying the style of the like buttons, but for answers. If we want users to mark tags as favorites, we could potentially use profile tagging to achieve this, but I guess if we already have a way to follow tags, we might as well use that. Great note and comment thread! Thank you @Ananyo2012 for putting this together and also for very detailed email communications. It's really great working with you. I share Stevie's interest in having whatever we create as Q&A being really easy to search for answers and contribute new answers. Basically the "following, sorting, finding" points mentioned above. In terms of how Q&A could be displayed, let's start by imagining a future where the abundance of questions and answers that are currently buried in (and repeatedly unearthed/reprised on) our mailing lists are now living on our website. With my limited imagination it seems like "spectroscopy-basics" or a similar tag that groups all "getting-started" questions together into a useful FAQ for first-timers is the critical move here. Would this FAQ emerge and reshuffle over time based on popularity or is it curated? How can Q&A be most welcoming/useful to new folks looking to get started? While it's amazingly helpful to have StackOverflow as a model, we don't have to follow it exactly. "Upvote" is pretty generic, how about getting directly to the point with a button that says something like "This is helpful to me" or "I have tried this, and it worked". To me, that is a more meaningful "click" that someone could contribute, and related to our culture of empiricism. I'm still musing on answer "approval." It seems straightforward to have the original person who asked the question be able to indicate if the answer was helpful, and i would want to know if the question-asker feels that they were helped or if they are still stuck. However, i wouldn't want to depend on one person to indicate the best answer, and perhaps the best answer changes over time -- maybe the top answer could emerge from how many people clicked "I have tried this, and it worked". I'm not sure, what do you all think? We are avoiding badging, reputation, reward, and gamification systems as long-term studies are revealing that they reinforce participation inequality. Public Lab does have a barnstar system for expressing community appreciation. @liz Thanks for your sincere thoughts on the ideas. It's great to have your views. Yeah I do support the tradition of Publiclab. Barnstar system is a great way of comunity appreciation. I am also not finalized my mind on the structure of the commenting system and would be happy to receive more suggestions on it and on the design. Though I think a Answer model would go a long way on organizing the Q and A system. Thanks gain for your views on this.